[tps_footer]Bollywood actress Aishwarya Rai Bachchan made her comeback with film Jazbaa, which was released last year on October 9. Being her comeback film, fans had lots of expectations from the actress but unfortunately, the film couldn’t perform well at the Box office. After Jazbaa, Aishwarya Rai Bachchan‘s much-talked film Sarbjit has released on May 20 and once again the film couldn’t perform well at the Box Office. The film, which is based on a true story of late Sarabjit Singh, has scored lower than expected on its first day and has managed to collect Rs 3 crore nett (30 million). Compared to Aishwarya’s last film, ‘Jazbaa’ had collected Rs. 3.75 crores net approx (37.5 million). 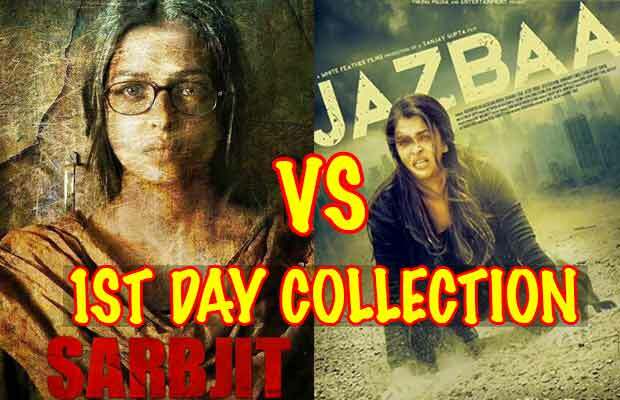 Comparing the first-day collection of both the films, the first-day collection is close enough, which shows that Jazbaa and Sarbjit both scored less than expected at the Box Office. ‘Jazbaa’ being Aishwarya Rai Bachchan’s comeback after a long time had raised the audience’s anticipation but failed to mint good numbers at the Box Office. On the other hand, based on a true story and hard hitting promotions, Sarbjit was below average on the first-day of its release.